Dubai, UAE, January 30, 2019: Emirati all-rounder, Yousif Mirza, heads to Europe with 11 of his team mates in their first set of races for the 2019 season, as they take on Challenge Mallorca, a four day competition from January 31 to February 3. Fabio Aru (Italy), Alexander Kristoff (Norway), Vegard Stake Laengen (Norway), Marco Marcato (Italy), Yousif Mirza (UAE), Manuele Mori (Italy), Rui Oliveira (Portugal). 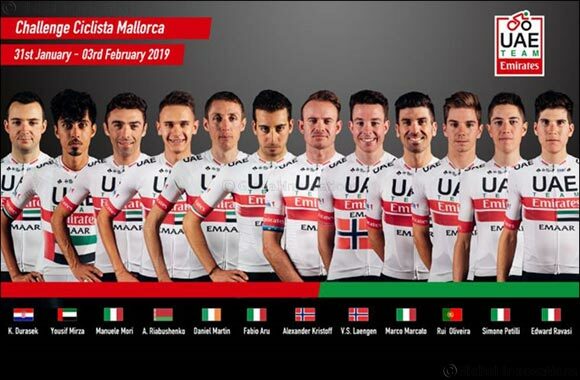 Kristian Durasek (Croatia), Alexander Kristoff (Norway), Vegard Stake Laengen (Norway), Marco Marcato (Italy), Manuele Mori (Italy), Rui Oliveira (Portugal). “The Challenge Mallorca takes a certain importance given that we have 12 riders heading there,” said Marzano. “Our objective is not just results, but to use the four days of racing to better understand how our winter training program has improved the riders’ form. The 12 cyclists will rotate in the races, with five riders not competing each day but training under the guidance of our coaches instead. We are confident that this Mallorca trip will help us in our overall 2019 plan, which has already helped us achieve great results in Australia and Argentina.